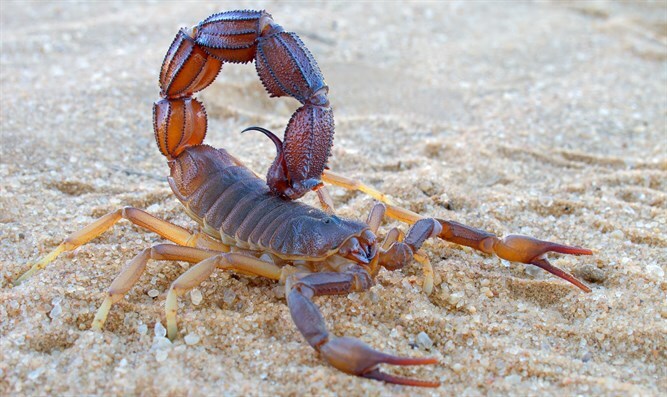 Girl in southern Israel stung by yellow scorpion, evacuated to hospital in serious condition. A toddler from a Bedouin town near Arad in southern Israel was stung by a scorpion on Tuesday. The scorpion which stung the child is the common Israeli Yellow Scorpion, also known as a “deathstalker”. The Israeli Yellow Scorpion is one of the most dangerous varieties of scorpions in the world, and its sting can be lethal, particularly to small children. After the child was stung, her family brought her to an MDA emergency center in Arad for treatment. MDA paramedics treated the girl at the center, then evacuated her to Soroka Medical Center in Beer Sheva. She has been listed in serious condition.